The International Women’s Day was celebrated on March 8 around the world. 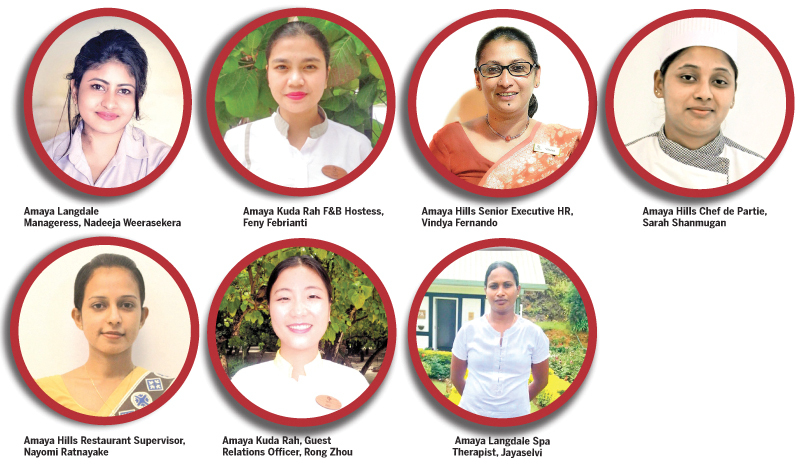 At Amaya Resorts and Spas, we have some amazing women who have been with the chain for years and have grown step by step in what they do. From Managers to Resident Managers to head of Housekeeping to Restaurant Captains, they take their role with passion and commitment to deliver the best of comforts to everyone and also paving the path for other women to step into their shoes and grow. These wonderful ladies shared their stories of how they lead and balance their work and personal life. Sarah Shanmugan works as the Chef de Partie at Amaya Hills and enjoys every bit of what she does there. She also adds that any woman who wants to join this field has nothing to worry as they will definitely have a bright future. Sarah will be taking part in the upcoming Culinary Arts and Food Exhibition 2019 organised by the Chef’s Guild in June. Nayomi Ratnayake who works as the Restaurant Supervisor at Amaya Hills said, “As a woman, majority of my colleagues are males and there are times we have to work at least 10-12 hours a day but we have no issues with them as we support one another like family. Everyone is treated equally here and there is no favourism for any gender in particular.” Two employees at Amaya Kuda Rah Maldives are from the Philippines and China and they expressed their views about working in a male dominant environment. “My challenge when I joined here was that I was the only female working at the restaurant. I have learned to adapt how to work and manage myself,” Feny Febrianti, F&B Hostess at Amaya Kuda Rah stated. “One thing you should know is what your dream is. Even if it means that sometimes your work may not be really good or is very difficult, always remember what you want,” Rong Zhou, Guest Relations Officer at Amaya Kuda Rah added. Amaya Langdale Manageress Nadeeja Weerasekera said “My role model is my mother and she’s the strongest woman I have ever seen in my life and guided me to do my best throughout from school to the present day. I really owe everything to her”. The door is open for inspiring women to take the lead to change what could not be changed and be a voice of change for the millions of voiceless women around the world. And the women at Amaya Resorts and Spas are some of those voices.